In this entertaining and detailed video, Mike shares his techniques for turning his signature hollow vessels. 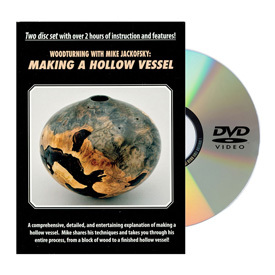 Mike’s comprehensive explanation and demonstration takes you through the entire process, from a basic block of wood to a beautiful hollow vessel. Comments On Feb 19, 2014:This is a great video for understanding Mike Jackofsky's technique for hollowing, specifically hollow forms. The audio and video quality is well, and the video is designed in a manner so that it keeps the viewer interested. Mike does not focus on selling you his tools, however the video does go into detail how to use his tools, and the resulting finish. Overall it is a great video to watch and a great resource to assist in improving ones hollowing skills.